West End Dumplings: Remember those car window frost shields ?! Remember those car window frost shields ?! Here's a test to see how old you are: do you remember car window frost shields ?! For those that don't, they were rectangles of plastic with a raised adhesive strip around the entire edge. You stuck them to the inside of your car windows and they prevented condensation from forming and becoming frost. If you want to get technical about it, here's a 1941 patent for a frost shield that explains how the work in excruciating detail ! 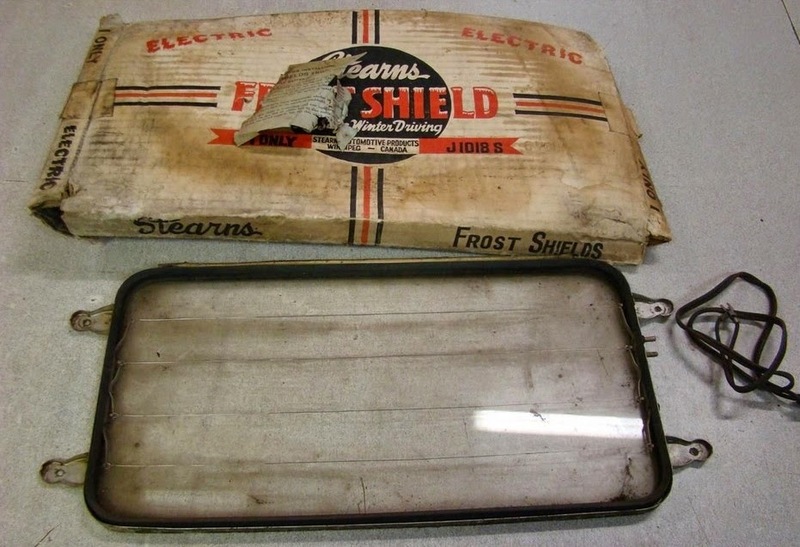 Frost shields burst onto the automotive scene in the winter of 1926 - 27, long before front and rear window defrosters were a gleam in the eye of automotive engineers. They were soon a standard part of your basic winter tune-up, along with radiator grill covers and winter anti-freeze. 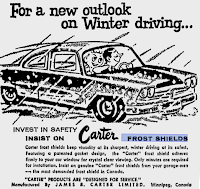 In 1937 it became law in Manitoba that your windshield, rear window and front-row side windows had to be fitted with frost shields from December 1st to March 31st. The law was updated a number of times to tinker with the size and placement of the shields. When spring came, the car owner had the unenviable task of trying to remove what was left of the shield and its adhesive residue. 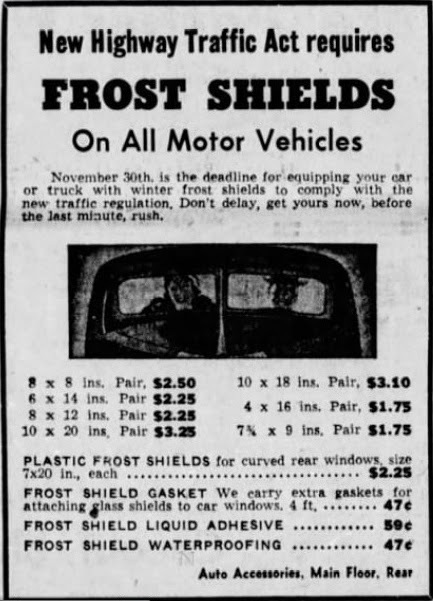 57(2) The windshield, rear windows, and windows at both sides of the driver's seat, of every motor vehicle at all times between the first day of November in each year and the thirty-first day of March next following, both dates inclusive, shall be equipped with adequate frost shields of a size and type that will prevent or minimize the condensation thereon of moisture in the atmosphere and allow the driver to have a view sufficiently clear and unobstructed to permit him to operate the vehicle with safety to other persons and vehicles on the highway, unless the vehicle is otherwise so equipped or constructed as to secure a like result. 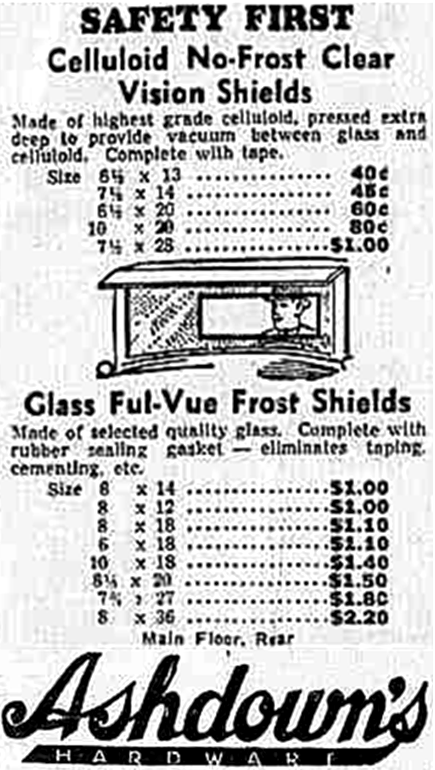 As you might suspect, Winnipeg was a hub for the manufacture of frost shields. 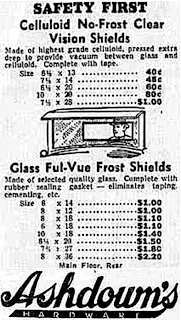 Until 1934 frost shields were imported to the province, mainly from the U.S.. That year, the Electric Heating and Manufacturing Company of Winnipeg showed off their patented Ful-Vue Glass Automotive Frost Shield at the Industrial Exhibition. In the mid-1940s there were at least four companies that made them. James B. Carter Ltd. (above) was likely the largest and sold them across the country. Through various mergers the company became Temro Phillips which still manufactured car interior heaters in Winnipeg until the plant was closed in 2012. In 1951 Del Richardson purchased the name and equipment from the defunct Stearn's Automotive Products of Minnesota and set up shop at 666 Arlington Street. 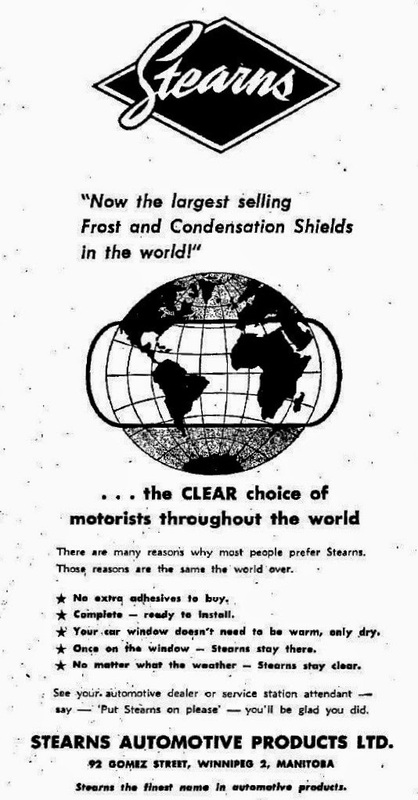 Within a decade they were selling frost shields around the world and considered themselves the largest manufacturer of the product, anywhere. In 1962 the company moved to larger premises at 92 Gomez Street to keep up with demand. In case you think that frost shields have disappeared into history, they haven't. They are still used in construction equipment, helicopters and out-buildings. The only company I could find that still manufactures them is, of course, right here in Manitoba. Check out Custom Tarps and Filters in Brandon ! In fact, my dad enjoys telling the story of how, during a road trip through the US in the mid-70s, a gas station attendant in a rough-looking part of St. Louis, MO admired his "bulletproof" windows! They were a strange sight, I can remember the running joke to tell Americans that it was to protect against Indian bows and arrows or to strengthen against polar bear attacks etc. 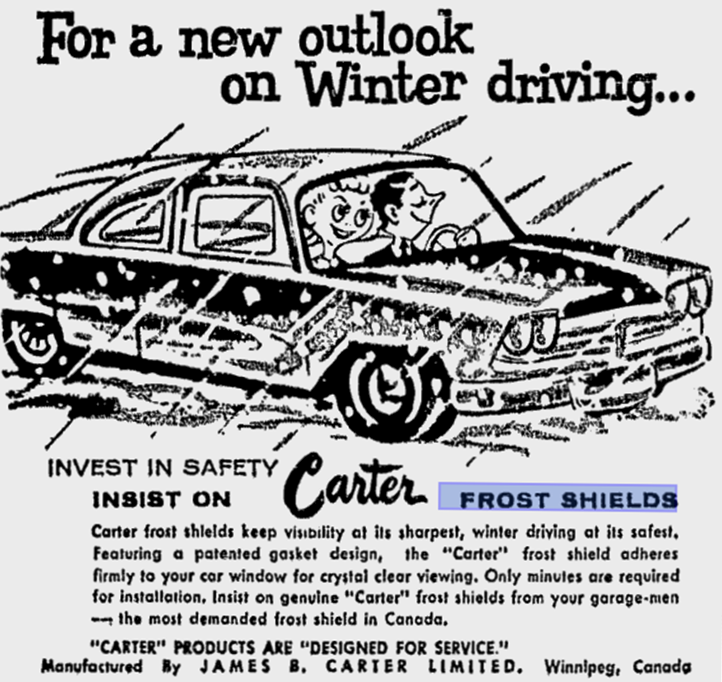 The decline of the frost shield industry may have been the turning point in Manitobas economic fortunes. Growing up in the 80's I remember my aunts car had these in the back side windows. Never really thought much of it at the time. Didn't know what they were till reading this post broguth back those memories. I remember well the use of frost shields. I worked for Purves Motors on Lombard St in Winnipeg all those years ago. Service Advisor, so we sold a lot of Frost Shields. One instance I recall well was a visit from a US customer who wanted an oil and filter change for his VW Van. It was powered with a Porsche Engine, which made it interesting for us chaps. He saw Frost Shields on several cars in the reception area and being interested he want to know what they were. I told him and as a memoir of his trip, he purchased a pair of EVERY SIZE we had in stock. Great throwback post, Christian! It makes me wonder why these window frost shields decreased in popularity. It seems like a very useful thing to have. Anyways, thanks for sharing!